Because nothing stays the same around here for too long, I changed up my husband’s dresser…AGAIN. When we moved into our house almost 10 years ago, we bought a grown-up bedroom set and we were so excited. Look at us! We’re like, REAL ADULTS, buying a whole matching set from a REAL furniture store…like, it has to get DELIVERED, not assembled or anything! No more mismatched hand-me-downs or bachelor pad stuff! We’re officially grown-ups now! Fast Forward several years, and the whole matchy-matchy thing was the last thing I wanted. My tastes changed, and I wanted a more collected over time look for our bedroom – sooo exactly THE OPPOSITE of what we spent so much money on just a few years before. So back when I gave the bedroom the first makeover, I painted the dark espresso wood with a light grey paint. It’s starting to take shape and I am THRILLED. Seriously, cannot wait for this one to be done so I can show you. It’s got shiplap (!!) and we’ve started installing – wait for it – NEW BIG BASEBOARDS! Wooooohooo! Not sure which of those two I’m more excited about. It’s amazing what a difference getting rid of skinny 1960s trim makes. But let’s get back to the issue at hand: this dresser. I wanted to do something a little different again (sensing a theme here?! I really am crazy). You might remember the old big nightstands we used to have in here that I had to get rid of? If not, you can check them out here. I had sanded down just the drawers down to the natural wood and stained them with Minwax Special Walnut. I decided to go with that same look, and replace the white knobs with brushed nickel pulls. I also went a little darker on the grey, and used some of my Sherwin Williams Grizzle Grey leftover from the kitchen island. I think this darker grey and wood combo, plus the pulls give it a masculine look, don’t you think? Stay tuned for more bedroom makeover posts coming soon! Love it! Great idea how you left the drawers natural. We have a bedroom set that was handed down (Ethan Allan) and I’ve been wanting to just paint the entire dresser/mirror white but now I’m thinking the wood drawers might be a nice contrast. 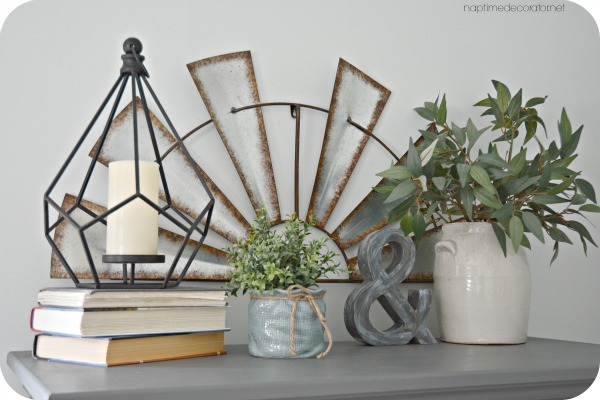 btw, loved the shiplap comment – Thanks to you I’m totally hooked on Fixer Upper! I decided a week ago that I am going to do this to my husbands chest of drawers too! Great minds…. Hi, Liz! I love the whole thing…the dresser and the styling! Is that candle holder a recent purchase and if so, where from??? Thank you! Yes, just got it from Hobby Lobby. I have a similar bedroom set from art van (different shape drawer front but same color). How do I know there’s actual wood grain underneath? I’d hate to sand and it be….. I don’t know. I don’t think there’s a way – I just had a hunch because this was an expensive set, I figured it had to be real wood;) I guess if you try and it’s not, you can always just paint it? Love everything you did here. Can’t wait to see the whole room!!! Saw this on Pretty Project Party! This is absolutely stunning! Absolutely stunning. One of the nicest dresser makeovers I’ve seen. This is amazing! 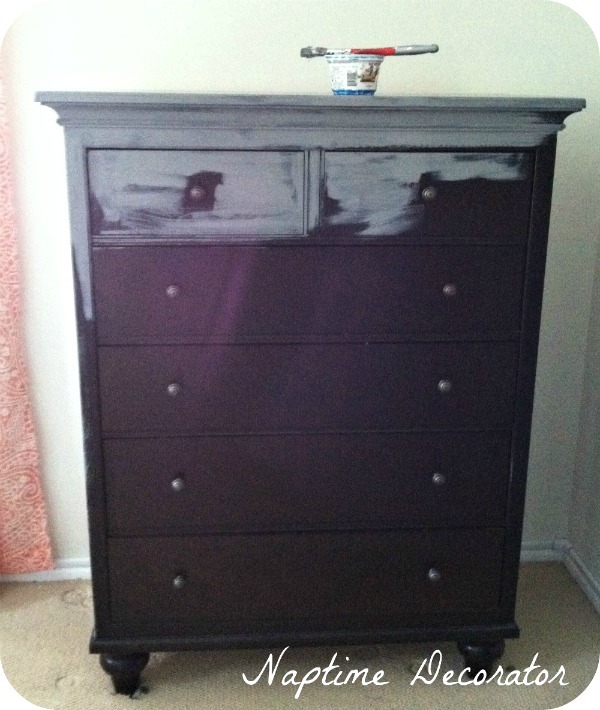 One of my favorite dresser makeovers ever! This gorgeous!!! 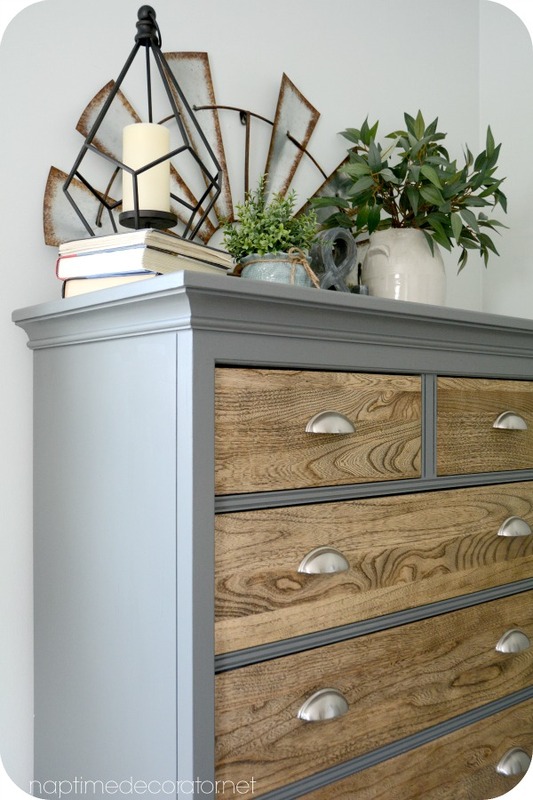 I am absolutely in LOVE with this dresser makeover 😄 I’m going to try and do this to a set that I just recently bought at a resale shop and pray that it looks half as good as your’s. I do have a question for you though how do you make the grey look so clean and smooth? I’ve never painted furniture before but the set that I just got is painted and it’s AWFUL!!! Paint brush marks and very very thick. Im sanding it down nice and smooth but I want to make sure it doesn’t end up the way it looks now. you don’t have to sand if you use chalk paint, and use a small foam roller or foam craft brushes to eliminate brush strokes. Beautiful! Question for you..did you paint the inside and sides of the drawers? Thank you! No, I did not. What type of paint did you use? This is absolutely gorgeous! I love it! Did you poly over the stain? If so, what finish did you use? No, I just left it raw. And thank you! Also, that stain color on your drawers looks more grey than the picture on the minwax can portrays. Did you do anything to the stain to give the wood that grey, weathered look? I have such a hard time getting the color you achieved. It’s perfect! No, I just used it straight out of the can. The kind of wood can alter the color a bit, so depending on what kind of wood you’re staining, it may turn out slightly different. What kind of wood are your drawer fronts made of? Where did you get the new dresser pulls? Ordered them online – can’t remember where, sorry! This dresser and the night stands are gorgeous. Especially impressive is combining the wood and paint. This is a perfect compromise for my husband, the wood lover, and myself, more of a paint person. He saw this and, “Waaahw, very classy”, he whispered with awe! Since it is long overdue for ours to be done my search for ideas had led me here. After seeing these, the decision is made! I just needed to clarify a couple of things: 1. How many coats of paint? 2. You mentioned adding a teaspoon of Plaster of Paris to what seemed like a sample jar of paint? Certainly a sample won’t do for the three pieces I am doing (about the same size as all of yours), so about how much Plaster of Paris would I add to a half a gallon of paint? BTW: We just added shiplap to one wall in two different bedrooms. Such a great feature to any room. After seeing these pieces of furniture, I can’t wait to see your shiplap. very nice , can this be done with pine??? It didn’t work for me and I had pine..Not enough character in the wood I guess. Beautiful!! Where did you find that windmill?? I love this look, I have been thinking about refinishing a dreaser in my son’s room and you have given me inspiration. 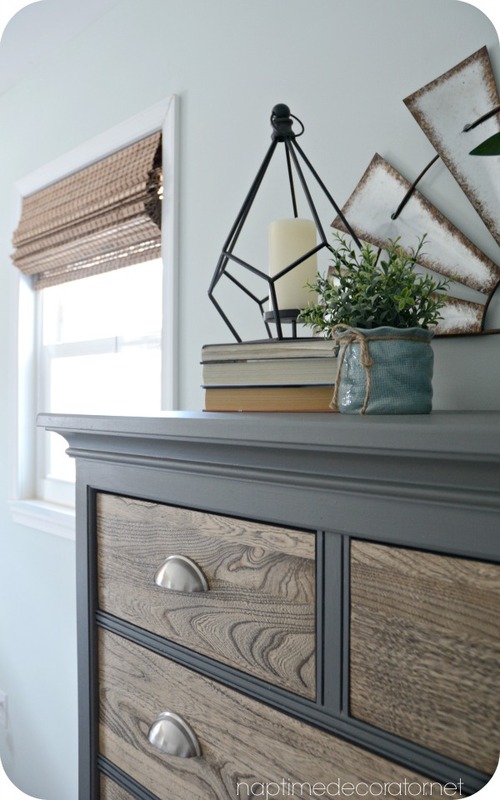 love the look of this dresser! what color are the walls in the room where this piece is? I’m getting ready to re-do my son’s bedroom and want to do this. thanks. Thanks! It’s Sea Salt by Sherwin Williams – good luck! Wow! This is gorgeous! I have an old wooden dressed that my awesome dad had sanded down to the natural wood for me. Been trying to think of a nice finish for it. I’m in love with that walnut stain you used! Thanks for the inspiration! Looks fabulous but I’m still too intimidated to try it in our master. Someday… Great job, and thanks for the inspiration. A very nice choice of color and stain, looks fantastic! what color is the stain for the drawers? It’s Special Walnut by Minwax. Do you happen to remember what kind of paint the gray is? just a sample of SW Grizzle Gray! thank you! Finally getting around to doing mine. I’m trying to get that same look. So you sanded down the drawer fronts until it took off all old varnish & finishes?? Then you painted them the Grizzle gray? Then did you rub the Special walnut over top of the gray? How close am I?? Thank you!! I just sanded the drawer fronts down to the bare wood, then stained them with special walnut. The grizzle gray went on the rest of the dresser:) The particular wood was nice and grainy underneath, so it might not be exactly what you have on your dresser. Good luck!! I just sanded my drawer fronts down and got very lucky that the wood underneath was super grainy and lovely:) Then I just stained it. A friend recently did a similar makeover to a changinging table. Hers was not real wood, so she used the wood grain laminate flooring that is sticky on the back to cover the drawer fronts. Looked amazing, as does yours! Just a suggestion for those who may not have a solid wood piece. 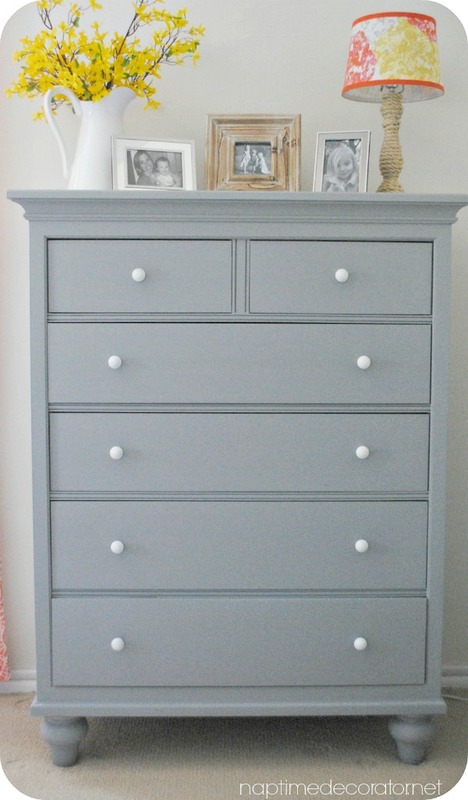 Did you sand down the grey part of the dresser first or just paint right on top? I added plaster of paris to the grey paint and painted right on top. Do you mind me asking how much you used? Did you use a whole gallon of paint? How much plaster of paris per gallon? Thanks a million! I have a piece of furniture that I would love to replicate with this look! For a dresser this size, you just need a sample size of paint. I never measure, but it’s probably about a tablespoon per cup of paint? You could look it up – many blogs have used this technique and i’m sure there’s precise measurements somewhere! Good luck! Hi Liz, love what you’ve done here. I’m about ready to paint our old oak dresser. What type of paint did you use? Thanks, Lisa! I just used a sample of SW Grizzle Grey with a little plaster of paris mixed it so it went on well. What does the plaster of paris do? What’s the purpose off adding it to your paint? And if you could tell us the steps you used in painting the dresser grey, that would be great. I don’t see any brush marks. It gives it a nice flat finish, and it helps the paint stick without having to sand. I use an angled 3-4 inch brush. That’s about it! Hi, beautiful work. Did you use a polyurethane after staining the drawers with Minwax Special Walnut? I did not, but you certainly could if you want! Hi! When you painted over the original wood with grey paint, did you sand first? Also, what kind of paint did you use? Thanks! I now see that my questions have already been answered! I love this! 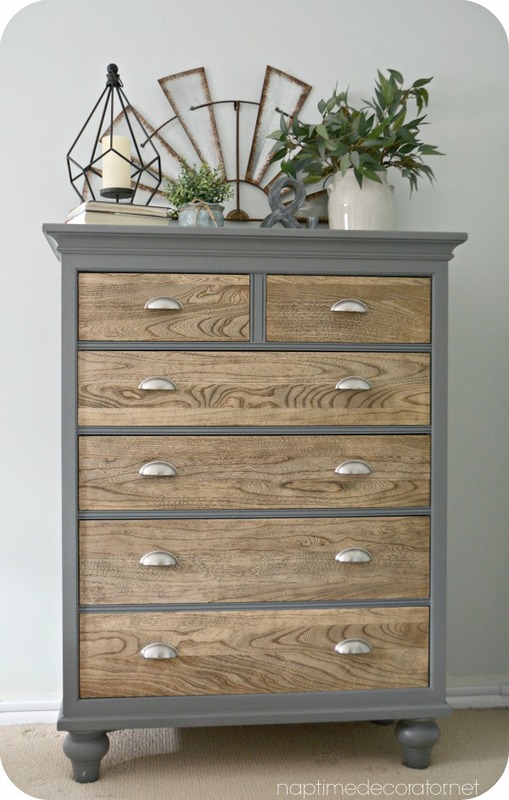 Looks just like this pier 1 dresser I fell in love with but haven’t bought yet. Maybe I’ll just do it myself! What I REALLY need to know is what was the last grit level of sandpaper you used on the wood before staining? Also, It should be noted that mixing Plaster of Paris with paint will lighten the color approx one step lighter on the color strip. Truly a stunning piece! I can’t stop looking at it. Beautiful piece. Redoing my sons room. He has pine furniture and my husband just sanded it down today. We wanted it to match and make it more masculine for a teenage boy. Thanks for the idea. You’re so welcome! Thank you! I’m trying to replicate what you did but special walnut looks so much darker on everything I look at. Did you do something else to the drawers? No, I just applied the stain – but I’ve noticed from my experience with staining different things, that it will look different on different types of wood. Did you use a electric sander ? I’m sorry, can’t help you there – mine aren’t painted – I sanded them down and stained them. Good luck! This looks great. I may try something similar with an antique dry sink that is dullsville in our house. I have to figure out if it needs stripping first. Thanks for sharing ! Did you just mix in the plaster of Paris directly to the paint or mix the plaster of paris with water and then mix it in? I just mix the plaster right into the paint, but I have heard a lot of people like mixing it with water first! Thank you! I am going to try it! Hi Liz, I love this dresser and want to do the same thing for my sons dresser. Did you use a satin, semi-gloss, or gloss paint finish? I used a satin – it was from a sample at Sherwin Williams, and their samples come in a satin finish. Thank you so much, and good luck! Very beautiful dresser! Was hoping you could tell me the dimensions so I can have my hubby make one lol. You did a great job! Hi there! I’m Liz, a former teacher-turned-stay-at-home mom to three kids, with a passion to create a warm and inviting home on a budget. This blog all started when I’d put the babies down for a nap, and squeeze in a project during those precious couple of hours! My hope is that you visit this page and feel inspired to do a little “naptime decorating” of your own. Thank you so much for stopping by! My Favorite Home Must Haves…Dog Owner’s Edition! If It Ain't Broke...The Search for the Perfect Bedroom Color is Over. For Now. Our Master Bedroom Makeover: The Reveal!